A beautiful selection of Irish Fragrances from the garden of Ireland. County Wicklow is home to some of the most beautiful arrays of flowers, some carefully planted in formal gardens, others growing wild along the hedgerows. A magical fruit and floral fragrance: Lightness, freshness and youthful zest which devlop into a classically elegant and very rich woody floral perfume of great depth and transparency. 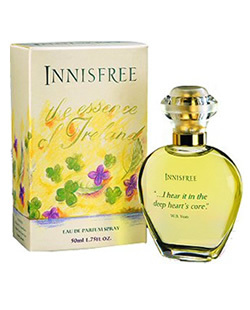 The perfume, through a beautiful representation of Ireland, encapsulates and mirrors the unique emotional experience that is in the W.B.Yeats poem"The Lake Isle of Innisfree". Inis Ór is a rich, sensual, exhuberant, Inis Or is inspired by the energy in the excitement of the anticipation of an evening with loved ones. This passion for life is emulated in the rich citrus top notes that are given vitality with the fresh green middle notes and the warm sensuality of the spiced earthy woody base notes. A scent offering a sense of light, fire and warmth. Great Gifts for Saint Patrick's Day and Mother's Day too. Irishshopper currently ship these products to the UK, Ireland, most EU Countries, USA & Canada.